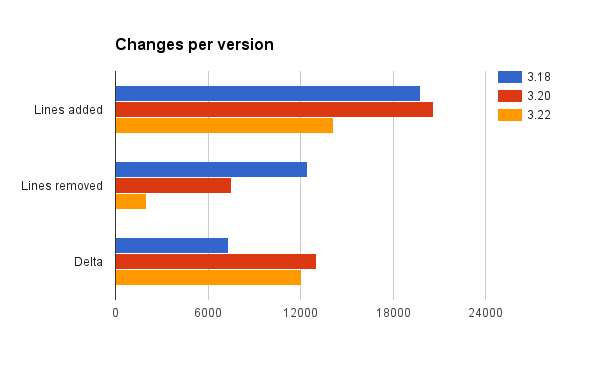 Now that GTK+ 3.22.0 and GLib 2.50.0 have been released, it’s time to look back at this development cycle and see the contributions from people and companies that made these releases possible. The statistics do not include translations. 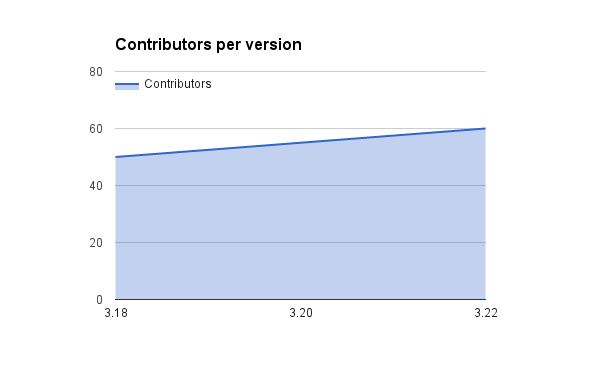 The trend for contributors in GLib in increasing, even if the size of changes has decreasing. 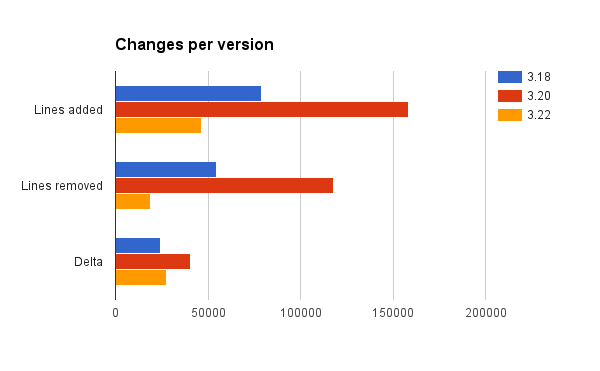 Matthias Clasen and Philip Withnall have been the biggest contributors, this cycle. Matthias worked on the portals implementation for allowing sandboxed applications to access system services; Philip worked on the new structured logging API. 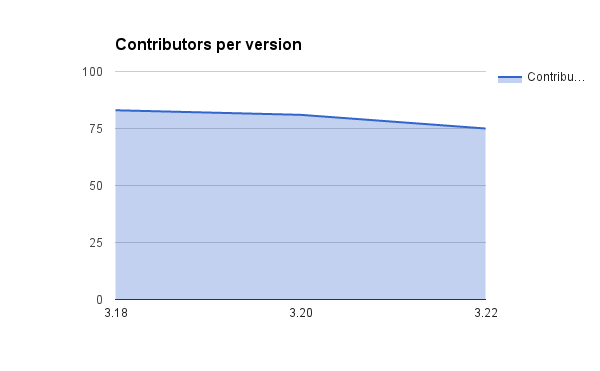 The number of contributors is trending downwards, and given that the amount of changes has also reduced, it’s likely a reflection on the overall stabilization process towards the 3.22 long term release. Just like he did in GLib, Matthias worked on implementing support for portals inside GTK+, especially the ones that require user interaction like file selection and printing; Carlos Garnacho worked on the graphic tablets support in Wayland; Jonas Ådahl and Olivier Fourdan worked on the windowing system issues of the Wayland backend; William Hua worked on improving the Mir backend; Ruslan Izhbulatov and Chun-wei Fan worked on the Windows backend, especially with regards to keyboard input; Emmanuele worked on adding GLES support to the GdkGLContext API; Timm Bäder worked on GtkPopover; Matt Watson worked on GtkStack and the internal animation handling. As usual, much of these changes would not have been possible without the contribution of various companies. Really nice information! What about also placing these blog entries on planet.gnome.org? The formal rule for Planet GNOME is that the blogs are from people involved, or that have been involved with the GNOME project. Project blogs had their own aggregator, but it was retired because of very low visibility and traffic. We usually publicise blog posts on Google Plus, Twitter, and other social platforms. Why not doing a vulkan port to be totally future proof and have cleaner codebase than what gl can offer ? Mostly because Vulkan does not give us anything over our OpenGL use, and would actually require a lot more code to be written and audited; it would also require bleeding edge drivers and make testing more difficult. That’s not to say that we won’t ever add Vulkan support in GTK+, just like we have OpenGL; but, for the time being, no effort is being spent into writing Vulkan code. Obviously, if you wish to contribute a GdkVulkanContext API, I’d be happy to review your code.